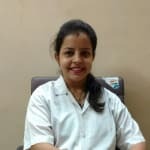 Dr. Swati Narang is a renowned Physiotherapist in Vesu, Surat. She has over 10 years of experience as a Physiotherapist. She is a COMT, MPTh/MPT . You can consult Dr. Swati Narang at Shree Physiotherapy Clinic in Vesu, Surat. Don’t wait in a queue, book an instant appointment online with Dr. Swati Narang on Lybrate.com. Lybrate.com has a number of highly qualified Physiotherapists in India. You will find Physiotherapists with more than 43 years of experience on Lybrate.com. Find the best Physiotherapists online in Surat. View the profile of medical specialists and their reviews from other patients to make an informed decision. I am always happy to see Dr Narang. She is been a life-saver for me since my first visit with her. I was suffering from severe neck pain due to which dizziness started. She gave a very simple treatment to cure me. l have been suffering from this problem since 15 days. She got me off. Some Traction and manipulation has been given to me. She is patient, very courteous and professional. She explained everything about my appointment and answered each and every questions that I had. I would highly recommend her to others. Thank you once again Dr. Swati Narang. Dr. Swati Narang provides answers that are very helpful. it was very helpful and thanks a lot. Can Physiotherapy Help Relieve Lower Back Pain? Exercises For Sciatica - Learn More! The sciatic nerve is one of the largest nerves in the body. It goes from the lower back all the way down to the base of the leg. When there is a disorder associated with the sciatic nerve, it is known as sciatica. Sciatica, however, does not necessarily need a surgery or a very elaborate procedure to fix the problem. Most commonly, it is treated simply by practicing a number of simple exercises. In this stretch, the starting position is on your back side. You have to have your legs out and feet upwards. From this position, try to bring your right leg towards your left shoulder. Hold this for 30 seconds and then release and relax. Repeat this exercise three times and then repeat the whole procedure with your other leg. Only take your leg as far as it will go. Your physiotherapist may also provide you butler mobilisation to help you get rid of the sciatic nerve. This has been a very successful way of treating this problem. This is also a very effective technique for providing immediate relief to the sciatic nerve patients. It is a widely used by physiotherapists to help their patients. Cervical Osteoarthritis - How Does Physiotherapy Treat It? Cervical osteoarthritis is also known as cervical spondylosis. It is a medical condition which involves changes in the joints of neck, bones and discs. This is generally caused due to the deterioration of the muscles owing to old age. With age, the cervical spine breaks down and loses all its fluids. This leads to stiffness in the spine. It occurs usually in middle aged and old aged people. This causes stiffness and severe neck pain. Corrective surgery is helpful to cure Cervical Osteoarthritis. Headache which usually emerges from the neck. Severe pain in the arms and shoulder. Not being able to turn the head or neck fully while driving. Muscle spasm and abnormal reflexes. Grinding sensation or noise caused while bending the neck. Heat modalities- In this method the pain and stiffness is reduced by putting heat on the affected area. This type of therapy is called heat therapy. Manipulating therapy- This form of therapy is used by massage therapists. They massage and manipulate the joints so that the muscles can function smoothly. Hydrotherapy- This therapy involves exercising in a pool. Hydrotherapy is extremely beneficial for people having severe joint pain and stiffness. Cervical traction- This is a common non-surgical treatment which cures pain in the neck by opening the cervical foramen (hole or passage). Physiotherapy is the most natural and safe way of curing cervical osteoarthritis. If you are diagnosed with cervical spondylosis, you should start physiotherapy as soon as possible. 5 Ways Physiotherapy Helps In Dementia! Dementia is a general classification of a brain disease that causes a long haul and frequently steady abatement in the capacity to think and recall that is sufficiently incredible to influence a man's everyday functioning. Other normal manifestations incorporate passionate issues, issues with dialect, and a lessening in motivation. An individual's awareness is not influenced. The most common example of dementia is the Alzheimer's disease. 1. Physiotherapy can keep up the Alzheimer's patient's freedom and mobility as much as one could expect reasonably. A physiotherapist can outline a home activity program and work intimately with relatives to administer to the Alzheimer's patient. 2. Physiotherapists, as independent experts, embrace much detailed, separately custom-made appraisals of the disorders, action confinements and restrictions imposed upon individuals with dementia. 3. The caretakers of individuals with dementia regularly show weakness when contrasted with their same aged companions. Physiotherapy helps with diminishing the weight of consideration by instructing caregivers to provide encouragement and upliftment to individuals with dementia. 4. Patients with dementia are always at a risk of falling down, and hurting themselves. Poor balance accounts for the danger of falls. This can be worked upon and improved by physiotherapy-driven exercises. Exercise can have a huge and positive effect on behavioral and mental indications of dementia, enhancing psychological capacity and mindset, which can decrease the doses of strong medicines. Special exercise routines are assigned to the patients which help improve their body balance while walking. 5. Physiotherapy has crucial influence in advancing and keeping up portability of individuals with dementia. It assumes a basic part in the end of life consideration by overseeing situations, seating and complicated muscle contracture. Individuals with dementia regularly experience issues in communicating pain. Pain influences cognizance, inspiration and reaction to any intervention. Physiotherapists are specialists in recognizing and treating pain in dementia patients and give training to care home staff and caregivers of the patients. How To Stop Knee Pain With Strengthening Exercises? The knee is one of the largest and most important joints of our body. It is also susceptible to wear and tear as well as injuries. Knee pain can occur due to a variety of reasons starting from conditions like arthritis and osteoporosis as well as injuries that can affect the ligaments, the joint, the menisci and femur. These are the various parts of the knees, which can suffer from degeneration or even injuries. The best way to combat chronic knee pain is through rest, ice compress and with the help of pain relieving and anti-inflammatory medication. The Towel Hook: Lie down flat on your back and raise one leg, Hook a towel under the foot and press it against the towel as you pull both ends downwards, creating slight pressure. This can be done for a few seconds at a time. Remember to do this at least ten times for each foot and increase gradually. This exercise helps in strengthening your entire leg from the calf to the knee and even the thighs so that the pain subsides. Towel Roll: In towel roll exercise, after pushing knee, should do dorsiflexion and hold for 20 seconds.. Hamstring exercises are also given by placing roll towel under your feet, push down, dorsiflexion and hold for 20 seconds Adductor exercises are also given by placing small ball between your legs just above the knee joint, press and hold for 20seconds. Swing: For this exercise, you will need to sit down on a chair. Now take one leg and swing it up until it is in line with your hip. Hold it out like this before you slowly bring it down again. Do this at least twenty to thirty times for each leg and gradually increase the frequency and the number of seconds for which you hold the knee. This will also help in pain management. Knee Marches: You can also do knee marches by sitting down on a chair. You will need to march each knee up and down at least twenty to thirty times. You will need to do this for a few minutes every day and you can easily do it twice a day even when you are at work, sitting in front of a desk. You must ensure that your posture is straight and upright for this exercise. I have stiffness in both the legs. My right knee has gap. I can walk or stand for very little time as my calf muscles are always tight, my feet arches also pain. Since my periods stopped in march 2016 gradually these symptoms have become worse. Don't ignore start doing knee strengthening exercises because after menopause generally females have complains because of hormonal imbalance. I would suggest you to take ice packs for 10 min of knee joint and painful area along with start do some quadriceps strengthening and calf stretching exercises. This will give you relief and relaxation. For any query please contact regards. I got a accident 2 week before in that accident I got injury in my left leg and paining the right of the right foot. I took the medicine but it's work so slow so I want the name of the medicine which fastly recover my injuries. You can take medicine for healing along with that do some quads strengthening and calf stretching exercises which will help you to recover soon. Also you can take ice pack for 10 min it will help to heal your surrounding tissues which are damaged. For any query please contact regards. Hello doctor, from today morning certain issues relating to the passing of urine was felt. Pain and irritation while passing urine and right now blockage of urine is also being felt. What would be the reason for this? What should we do? It seems to be uti or kidney stone. Kindly do examination to rule out the exact cause. Sonography and urine routine and culture test to confirm. There are many reasons it can happen so make sure to maintain proper hygience. Have lot of water intake. Every hour 1 glass this will help to wash out any urine infection or kidney stone. For any query please contact regards. My mother is 53 year old, she have joint pain last 2 year she applies pain relief ointment and medicine but no relief. Kindly go for her investigations like ra factor, calcium, vit b12, uric acid to rule any deficiency of inflammation. Kindly ask her to visit nearby physio for her treatment. At home you can ask her to take hot fermentation using alum (boil the water adding alum into it till its color changes to milky white). This will give her some relief. And learn some general exercises for the joint she is having pain. Rather than taking medicine you can give her home treatment and exercises. For any question kindly contact be healthy regards. My mother slip and fell in the bathroom about a week ago. She said her left leg was twisted but we saw no sign of bone crack. But she still has pain in her left foot and knee. The left foot is swollen. I don't know what to do. What happened to her! She might have ligament injury because of that there is swelling and pain. Please use ice pack for 10 min over the affected and tell her to keep her feet elevated. If required use crepe bandage. Also ask her to do slight ankle movements to prevent any further restrictions. Take her to nearby physio and start her treatment as we have specilalised machines and exercise plan to get cure from any joint pain. For any query kindly contact. Be healthy regards.